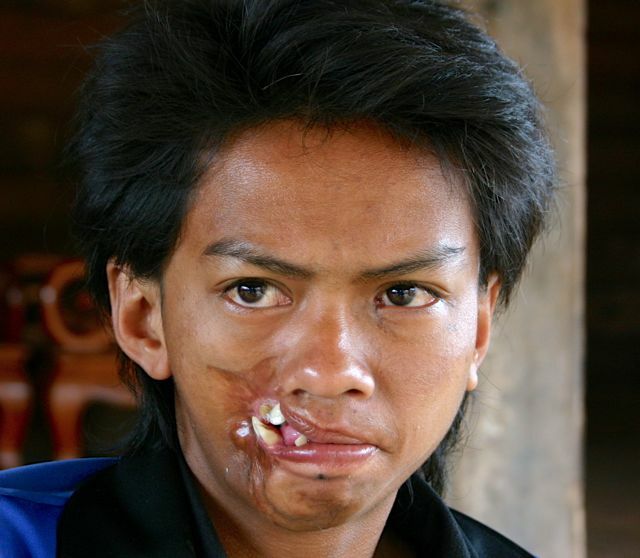 This young man survived oral facial gangrene as a child but was left disfigured. Through the efforts of Interplast, the Woman's International Group of Laos and We Help War Victims he was able to receive corrective surgery. Some 88 people suffering from severe burns or other disfiguring conditions have received free surgical treatment, thanks to the support of the Interplast Australia and New Zealand medical team . Surgeons from Interplast and Mahosot Hospital met yesterday to evaluate their surgical achievements during their10 day working stay in Laos from February 18-28. Director General of Mahosot Hospital, Associate Prof. Dr Bounthaphany Bounxouei, thanked the seven surgeons, nurses and anaesthetists from Interplast Australia and New Zealand led by Dr Philip Slattery for providing the opportunity for poor people to receive effective treatment for their disfigurements. “The programme has not only helped the patients, but also provided much needed training and hands-on experience for local medical staff,” said Dr Bounthaphany. In addition, he thanked the Women’s International Group (WIG) for their team support and financial support to the patients and their care-takers. Present at the evaluation was Australian Ambassador to Laos, Ms Lynda Worthaisong, who said the project not only strengthened the relationship between the Australian and Lao medical teams, but also the relationship between the respective countries. The Interplast team is funded by the Rotary Club of Australia. Their doctors, nurses and anaesthetists volunteer their time to come to Laos and work with their Lao counterparts on a regular basis, coming to the country every six months and working for two weeks at a time. They provide assessment support and surgery for patients, many of whom are children, with some of the most complex surgical problems including severe burns and other disfiguring conditions. In the past, the Interplast team has travelled to rural areas to conduct operations on people from remote villages, but more recently the surgery has been performed in Vientiane. While the Interplast Australia and New Zealand team has been in Laos, the Women’s International Group, based in Vientiane, has helped patients with transport and other costs during their stay in the capital, aiming to ensure that treatment can be accessed by those who need it most. Mahosot Hospital and the Interplast team have been working together for over a decade now. In the past there was a focus on cleft lip and palate surgery. Interplast Australia and New Zealand signed a new three-year agreement in 2011 to continue to treat patients in Laos. During Interplast’s last visit to Mahosot Hospital in 2012, the team met with more than 100 patients, more than 60 of whom required surgical intervention. The Interplast team first worked voluntarily in the Pacific Islands during the 1960s and this programme was expanded to other countries in the region. They are now working in many developing countries in the Asia-Pacific region. The Interplast team was first invited to Laos by the government in 1996. Hello, I am an Australian citizen,who was living in Laos PDR for a year up until August 2013. During the time I lived in Luang Prabang, Laos, I came across a 10yo boy, Noon, who has a growth across the middle of his face that has pushed down his nose so that he is quite facially disfigured. I took Noon to see some foreign (including Australian) doctors at the Luang Prabang hospital, possibly from your organisation, around September 2012. The doctors suggested that Noon needed a neurosurgeon because the growth might be close to his brain. Does your organisation have neurosurgeons who travel to Laos? If not, can you recommend someone who does.